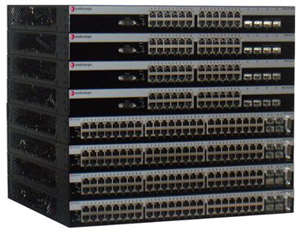 The Extreme Networks B5 is a scalable, high-performance Gigabit Ethernet switch offering support for IEEE 802.3at compliant high-power PoE, flexible 10 Gigabit Ethernet options and enhanced automation capabilities to provide for a future-proofed solution that significantly reduces operational expenses for customers. All B-Series products include a comprehensive lifetime warranty that includes services for which many competitors charge additional fees. Included benefits, such as advanced hardware return, firmware feature upgrades (which most vendors cover at most for 90 days) and telephone support (which most don’t include or severely limit) combine to significantly decrease operational costs for organizations – equaling savings of up to $1 million in service contract fees over the life of a customer’s network.